We’d love your help. Let us know what’s wrong with this preview of The Grandmother Paradox by Wendy Nikel. When Dr. Wells, the head of the Place in Time Travel Agency, learns that someone's trying to track down the ancestors of his star employee, there are few people he can turn to without revealing her secrets. But who better to jump down the timeline and rescue Elise from being snuffed out of existence generations before she's born than the very person whose life she saved a When Dr. Wells, the head of the Place in Time Travel Agency, learns that someone's trying to track down the ancestors of his star employee, there are few people he can turn to without revealing her secrets. But who better to jump down the timeline and rescue Elise from being snuffed out of existence generations before she's born than the very person whose life she saved a hundred years in the future? 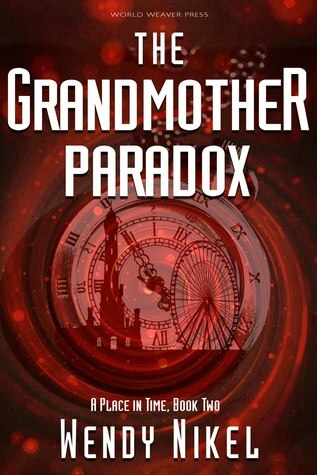 To ask other readers questions about The Grandmother Paradox, please sign up. I received this novella (as well as the first) from the publisher via LibraryThing's Early Reviewer Program. This engaging sequel to The Continuum takes one of the side characters, Chandler, and gives him the starring role in a mission to the past. In the first novella, Elise traveled to the future to track down Chandler, a rogue agent living in a new technological marvel. It turned out Chandler wasn't such a bad sort, and that his employer, TUB, was the dark entity in the new time travel industr I received this novella (as well as the first) from the publisher via LibraryThing's Early Reviewer Program. This engaging sequel to The Continuum takes one of the side characters, Chandler, and gives him the starring role in a mission to the past. In the first novella, Elise traveled to the future to track down Chandler, a rogue agent living in a new technological marvel. It turned out Chandler wasn't such a bad sort, and that his employer, TUB, was the dark entity in the new time travel industry. Well, TUB blames Elise for some bad things that happen in the future, and therefore they aim to attack her very existence by trying to kill one of her ancestors. This is where Chandler comes in. He's sent to protect Elise's distant relative Juliette during a vulnerable time when she spends the summer of 1893 traveling as the assistant of a sideshow magician. This allows the book to not only explore what magicians were like in this period, but also leaves room for some climactic action at the Chicago World's Fair. This is the second novella in the Place in Time series. I enjoyed the first one so much that I decided to buy this one. I was not disappointed in the story itself, but I deducted one star because it was $4.00 for a novella that is only about 90 pages long - I read it in less than two hours. But it was good. Dr. Wells of the time travel agency learns that someone is trying to track down the ancestors of Elise in order to prevent Elise from being born. He asks former secret agent Chandler, who was This is the second novella in the Place in Time series. I enjoyed the first one so much that I decided to buy this one. I was not disappointed in the story itself, but I deducted one star because it was $4.00 for a novella that is only about 90 pages long - I read it in less than two hours. But it was good. Despite this being the second in a series, I read it without having read the first (Continuum) and did just fine, thank you. We start the story with Chandler getting sent back in time by time traveling genius Dr. Wells in order to protect the great-grandmother of Elise (main character in first book.) Chandler gets to hang out at a circus/magic show because Elise's grandmother is a magical assistant. Only, someone's obviously trying to kill her because they're messing with the magical props. The ci Despite this being the second in a series, I read it without having read the first (Continuum) and did just fine, thank you. The circus bits, and later on, the world fair descriptions were the parts I most enjoyed. I get easily confused by time traveling paradoxes, although this one was pretty straight forward even when it became increasingly clear who the grandfather was going to be. This is a novella, and so while I wished we could have lingered longer in the World Fair, or had more dastardly sabotage attempts of the magic show, things moved along speedily. "You'd think I'd be used to this time travel stuff by now; this strange, in-between experience where I can punch myself and know I'm alive, but no one else I've ever known is yet?" I really loved this little book I was given by the author in hopes that I might write an honest ,unbiased review. We meet Chandler, who has a task to go and save the progenitor of a family in order to protect someone in his current time. With tongue planted firmly in cheek, Wendy Nikel alludes to every time travel ment "You'd think I'd be used to this time travel stuff by now; this strange, in-between experience where I can punch myself and know I'm alive, but no one else I've ever known is yet?" I really loved this little book I was given by the author in hopes that I might write an honest ,unbiased review. We meet Chandler, who has a task to go and save the progenitor of a family in order to protect someone in his current time. With tongue planted firmly in cheek, Wendy Nikel alludes to every time travel mention from H.G. Wells to "Back to the Future" as she presents the ethical dilemmas that might occur when the possibility of the paradox of "I am my own Grandma" might actually happen. An enjoyable time travel read. I really wish the author would write a novel instead of a novella. I think it could be improved with more development of the story. It all happens so quickly which makes the romance part rather far fetched. Sometimes it reminds me of an action film without character development and world building, just one event thrown in after another. The story would be improved by characters going through more together, an exploration of TUB and showing us through events, rather An enjoyable time travel read. I love these books and I love Wendy Nikel's writing. The continuation of The Place in Time series reminded me of another much loved trilogy, BACK TO THE FUTURE, with as many twists and turns in a person's timeline as to make you stop and wonder, "Wait--if X went back and did this, and Y then did this, then that means...holy cow!" And then you have to pick up the next one and see how that all actually played out. And the ending to this one has a real interesting conundrum! Book 2! I hate not knowing what's going to happen AND having to wait for the next novel. Yes, yes, Nikel gave hints so you're not left completely in the dark, but it's not a satisfying ending..YET. I've enjoyed both books in this series so far and can't wait to see where Nikel goes in the future! Just like The Continuum, this book tries to play with some interesting ideas. I enjoyed the story, but felt like it could have been so much better. The pacing was well done until the last 18% of the story where it felt very rushed. A terrific sequel to Wendy Nikel's "The Continuum." The story, while moving at a faster pace, does a great job on showing how all the characters -- Elise, Juliette, Chandler, and Dr. Wells -- are all connected. I read this back to back with Continuum. I loved them both. Great time travel stories, quick to read but utterly complete in themselves. I hope there will be more. Enough potential that I stuck with it. But always seemed a bit simplistic both in plotline and the travel setting / staging. Sign up for my author newsletter at http://eepurl.com/bkjwg5 to receive a FREE short story ebook! Wendy Nikel is a speculative fiction author with a degree in elementary education, a fondness for road trips, and a terrible habit of forgetting where she's left her cup of tea. Her short fiction has been published by Fantastic Stories of the Imagination, Daily Science Fiction, Nature: Futures, and els Sign up for my author newsletter at http://eepurl.com/bkjwg5 to receive a FREE short story ebook! Wendy Nikel is a speculative fiction author with a degree in elementary education, a fondness for road trips, and a terrible habit of forgetting where she's left her cup of tea. Her short fiction has been published by Fantastic Stories of the Imagination, Daily Science Fiction, Nature: Futures, and elsewhere. Her time travel novella series, published by World Weaver Press, includes THE CONTINUUM (published in Jan 2018) and THE GRANDMOTHER PARADOX (coming in Jul 2018).